For those of you who have asked for an update, Jack is doing great...and yes, he's allowed up on the furniture. That's my buddy Jon Thomas, who helped make the Arcade & Attica Train accessible for people with disabilities. Learn more about JT's on-going mission here. Photo courtesy of Matt Williamson of Matt Williamson Photography 2008. Love This! Toddler Wakes from Coma Singing Mamma Mia! Just in case you want some more incentive and ammunition to talk with your kids (and yourself) about the possible dangers of texting, here it is. At the very least, please don't text and drive. Read the sobering NY Times piece here. Love this photo of my buddy Blair Williamson with Kym Johnson of 'Dancing with the Stars' at the DSALA 2009 SunDown Film Festival & Awards. Kym received the 2009 Vision Award for her efforts supporting those with Down syndrome, including the dance classes she leads for those with special needs. Thanks to my good friend Gail Williamson for sharing this photo and news, and huge thanks to Kym Johnson for her terrific work with individuals with DS in Los Angeles and in her native Australia. She's one terrific dancer and a class act. Photo courtesy of DSALA. Used with permission. 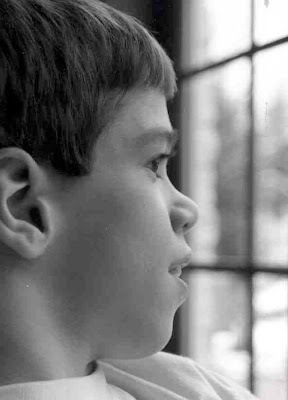 Just finished listening to the NPR' piece 'A Brother Recalls Life In the Shadow of Autism,' about a sibling who grew up in family with a brother with autism. Kari Taro Greenfield's book "A Boy Alone: A Brother's Memoir' about his childhood experience was just released. His is a bleak tale, and a harsh reminder of how tough and lasting the challenges of special needs can be on sibs- and how important it is that parents work hard to meet their needs, too. Even then, there are no guarantees. I found Greenfield's story incredibly sad. The direct link to the piece is not working right now. Perhaps it's overwhelmed with hits, so here is the link to NPR.org where you can find the story link once the glitch is fixed. Fascinating essay in Sunday's NY Times written by a man recently diagnosed with Asperger's syndrome by his wife, a speech pathologist who works with kids with autism. Read it here. Wonder how may other adults are walking around undiagnosed. The recently released video of the fights at the State School for the Mentally Disabled in Corpus Christi, Texas is sickening and deeply disturbing. We have far to go to ensure that all individuals with special needs are treated with the dignity, respect and human decency they deserve. Some justice was finally served last week when six employees of the home were finally indicted by a Grand Jury. But how did so many people remain silent and unchecked for so long as these sick games continued? Be sure to read my Mother's Day column 'Defining Motherhood' posted April 30th. Aussie Lovin! Please give a Shelter Animal a Home. What else can I say? I adore him! The economy has been tough on animals, too. Many have lost their homes or been abused. Please consider giving a shelter animal like Jack a home. Many are waiting, and they make great, loyal companions! It's one of the best life decisions I ever made.